* Add SunShield Solar Charge Controller? Drainage holes in frame prevents damage due to freezing/thawing of water trapped between frame and laminations. Solar modules are a substantial investment, regardless of whether your application is commercial, industrial or residential. Most solar panels share resounding similarities in appearance. So, it is virtually impossible to simply judge the quality of a solar module by its appearance. With an increasing number of fly-by-night suppliers in the market, it is an overwhelming task to choose reliable and affordable solar modules/panels. Solar panels should be considered a long term investment. The manufacturing process, quality of materials used and product warranty set solar panels apart. Low quality solar panels often times incorporate substandard or rejected base raw material and components. They are low in efficiency and are not sufficiently encapsulated or laminated to withstand moisture and harsh environmental conditions. They are typically not specially coated to protect against degradation by UV rays. These cheaply produced solar panels (often manufactured from rejected/refused silicone cells) are often times destroyed within a few months (even weeks) after installation. Sadly, in these cases, not only are the panels damaged, but serious damage can be caused to the other installation components and appliances that may be attached to the panels. Furthermore, these garage operated businesses fail to honor any warranty. So the customer is usually left with little or no recourse. A growing number of unscrupulous suppliers are obtaining rejected / recycled / used solar cells and hastily remanufacturing them and selling them as new solar panels. The rejected/recycled solar cells are often hand soldered and incorporated into new aluminum frames and then primitively laminated and sold as brand new panels. The longevity of these solar panels could be as little as a a few weeks as moisture and other environmental factors are known to quickly destroy them. In contrast, all components integrated into Ramsond solar panels are certified to be brand new. Ramsond only uses the most premium components and raw material in its line of solar panels. Ramsond solar panels use only 'Grade A' quality silicone cells. Ramsond does not incorporate used, rejected, refused or second-hand cells into its solar panels. Furthermore, Ramsond utilizes the most advanced technologies in the production of its panels. By way of example, the precision soldering process of Ramsond cells is fully automated and guided by microprocessor controlled robotic soldering arms. When you purchase Ramsond solar panels, you can rest assured that your investment safe and guaranteed by a viable company with a long history of service. In addition to selling used/recycled panels as new, many bargain-basement solar panel distributors/retailers are known to over represent or pad the actual output. The actual output of many of these bargain-basement solar panels is 30-50% lower than that represented. Ramsond solar panels, however, are certified and tested for accuracy of output represented in the product information sheet and specifications. Ramsond solar panels use the most technologically advanced and premium components. The Ramsond proprietary solar texture cell production system, equipment and protocol are among the most complex and advanced in the world. 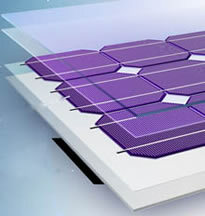 The solar cells are coated with a blue nitride anti-reflection coatings. This special coating process provides a uniform blue hue color and increases light absorption in all weather conditions. The encapsulation and lamination process used in Ramsond cells consist of a process that ensures true atmospheric vacuum and encapsulation of cells within laminations layers of High Ethylene Vinyl Acetate (High-EVA) and DuPont™ Tedlar®. The proprietary material used also create an anti- shocking characteristic which makes the solar panel more resilient to withstand hail, harsh environmental factors and extreme temperatures. Each panel is equipped with low-iron, patterned, tempered glass. The glass has been manufactured, again, through a proprietary process, providing up to 60% more strength, as compared to conventional photovoltaic (PV) glass. As a result, Ramsond panels are among the world's strongest, with hail impact survival index rating of 25mm@80 km/h. This means the specialized PV glass of Ramsond panels can withstand hail size of 1+ inch, traveling at speeds of approximately 50 miles per hour. Ramsond solar panels are framed in heavy duty anodized extruded aluminum with drainage holes. The aluminum frame is specially produced for Ramsond solar panels and is designed to provide a perfect balance of technology, style, function and appearance. The combination of the advanced components and production techniques, along with Ramsond's industry leading 25 Year Limited Warranty, make the Ramsond series of solar panels, among the most advanced in the world. While many are simply chanting 'green' slogans, Ramsond, everyday is pioneering 'green' innovations and ways to make them affordable and accessible. 'Green' is not simply a slogan for Ramsond. Ramsond was founded upon the principle that reliable 'green' technology can be affordable. Producing 'green' technologies of tomorrow is now possible through Ramsond's revolutionary innovations in technology and production. The affordability and accessibility of Ramsond solar technology is a giant leap towards energy independence and environmental conservation. Ramsond's range of solar modules are designed for adaptability to virtually every application. Affordable and efficient, they range in output from 5 Watts to 180 Watts. Available both in poly and mono silicon, Ramsond solar panels can be used for virtually any application.. Whether you intend to light your small cottage or have a project that requires power for a large metropolitan city, Ramsond is ready to become your partner in a greener tomorrow. With an annual capacity production of 300,000,000 Watts (300 MW), Ramsond has the capability of meeting the demand of any size solar power project. 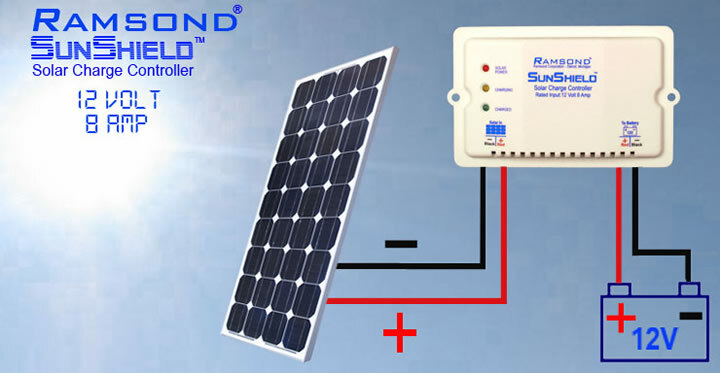 Ramsond's innovative SUNSHIELD charge controller (not included) is designed to regulate the voltage and current from the solar panel to the battery. It ensure that the battery is maintained at its optimal charge. Additionally, it protects the battery from over- charging and prevents the back-feed into the solar panel. For details about the Ramsond SunShield solar charge controller, please click on the picture below or click here to be redirected. When you purchase your Ramsond solar modules here, you can rest assured that you will receive your item in good order. We do NOT sell used, refurbished or reconditioned products. All items are BRAND NEW and available IN STOCK for immediate delivery. 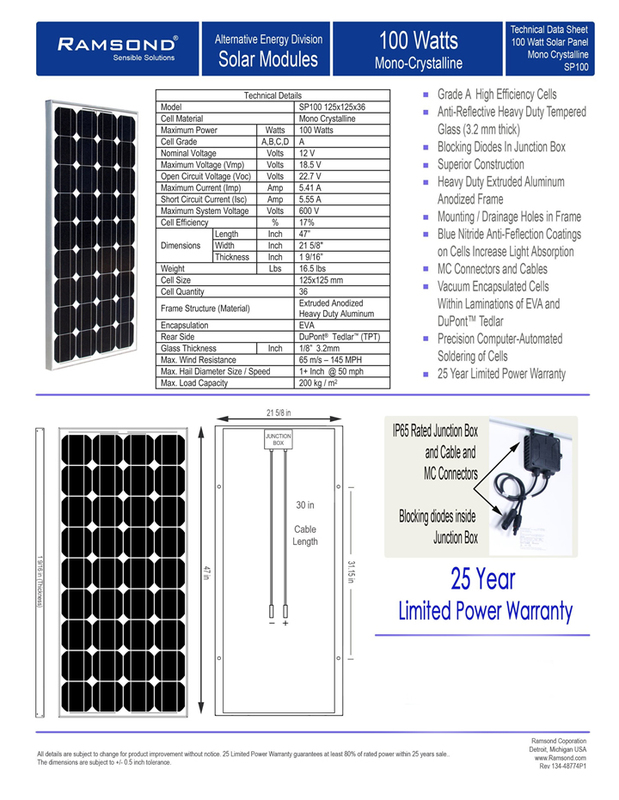 All Ramsond solar panels come with a 25 Year power Limited Warranty. Orders are shipped within 1-2 business days of receipt of payment. Your order will be immediately processed and shipped from one of our warehousing facilities in the US. You will also have the peace of mind of knowing that capable technicians and support team will be available to provide after-sale support. A superior quality product must utilize advanced packaging design and material. All Ramsond solar panels, ranging from 5 watt to 120 watt, are packaged in the most secure solar packaging available in the market. Each panel is encapsulated in a high strength molded polystyrene foam encasement and then placed in high strength corrugated cardboard box. This ensures that the solar panel arrives safety and free from damage. Additionally, each item, prior to shipping, is subjected to a rigorous inspection and quality control. Once the pre shipment inspection and packaging is completed, we will ship your item via the freight carrier of our choice (usually UPS or US Postal Service). From the time of shipping, the item usually arrive at your door within approximately 3-5 business days. Plan to install on my garage roof in the spring. Checked it out in my driveway and performed very well, but it only has 1/8 inch thick glass. Will install it in a heavy aluminum frame before installing it on my garage roof. Perhaps I am too cautious though. Perfect panel to step up too for some serious power and fun. Easy to attach to roof (1panel)even with mounting hardware and distance between rafters to calculate. With an Mttp controller, very early morning light starts charging the battery. Mttp is a must!! Be sure to have enough things to power and ideas and projects to do once it's all set up. I find having a fully charged battery and full sun shine with nothing to power very frustrating. Ha! Don't want to get it on the grid. I have the garage off grid and starting to bring indoors. I've had alot of panels and this is a Top Quality panel all the way around. Pleased as can be and it works superb.